Evolution is what the Rubis development engineers call it when they harmonize ultra-modern technology and traditional Swiss precision engineering in their ground-breaking precision instruments. Continuous innovation in recent years has enabled the premium label/brand to ready its classic tweezers to meet new and exacting demands. With three new developments at once, the experts from South Switzerland are back on the pioneering track: exclusive high-tech surfaces offer substantial added utility and clear customer benefits. 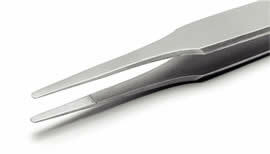 Ultra-modern nanotechnology closes even the tiniest of pores on the surface of the Nano tweezers. 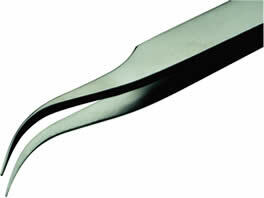 The instrument itself, as all Rubis tweezers, is made from extremely high-grade surgical stainless steel. The Lotus effect, engineered by the nanotechnology, causes dirt, oil, water and other liquids to simply pearl off the steel. 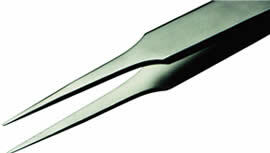 This keeps the tweezers perfectly clean, a beneficial feature particularly in a sensitive laboratory setting. However, the need for hygiene is no longer limited to what the eye can see. Rubis has come up with a unique solution to meet just such exacting requirements in the form of the Ion tweezers. The innovative special coating of the Ion model releases silver ions, which act as an antimicrobial to reliably neutralise bacteria, germs and other pathogens. Unlike other methods, the use of ion technology does not give rise to any resistance. Consequently, it represents a risk-free method of guaranteeing hygiene, even at workstations where instruments are used by several different people. The third innovation really does "get a grip" on things. The special soft coating of the new Grip tweezers not only provides a non-slip grip, it also improves the handling perceptibly. The easy-grip, soft-touch coating prevents hand fatigue, provides isolation and protects against the influence of heat. The latest innovation aims for a considerably longer service life. Durax™ tweezers with a tip as hard as 616HV Vickers-hardness are 6 x harder than the tip of a standard stainless steel tweezers. 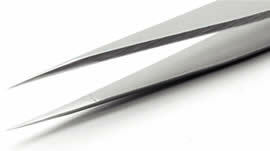 Even with intensive use Rubis Durax TM tweezers retain their original precision. The advanced material properties guarantee higher resistance against normal wear and tear. 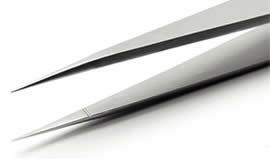 The Nano, Ion, Grip and Durax™ tweezers are available exclusively from Rubis. Already operating globally in the watch-making and electronics industries and in the medicine and cosmetics sectors for the past 60 years, these innovations give Rubis a strong point of departure to enter the laboratory products market. "We are highly specialised, possess unique expertise and offer our customers a product programme tailor-made to suit their exacting requirements," explains Fides Baldesberger, proprietor of Rubis. "And this goes for the laboratory products segment now, too." To constantly guarantee the first-rate quality of the products, each hand-made precision instrument and all its details are meticulously checked under magnifier glasses before leaving the workshop. In typical Swiss style, of course: As Fides Baldesberger puts it, "Only tweezers that pass this test carry the Rubis quality label//brand". Rubis is a leading international manufacturer of hand-made precision instruments. The Swiss premium label//brand has been manufacturing and developing high-grade precision instruments in the tradition of Swiss precision engineering at its workshops in Stabio for more than 60 years. Besides boasting an extensive product portfolio, Rubis also makes tools to its customers’ own specifications. Although Rubis tweezers were initially manufactured exclusively for the Swiss watch industry, the products are now employed across the globe in a wide range of applications in the electronics industry, in R&D labs, in medicine and in cosmetics. Rubis products are regularly honoured with international awards for the quality of their materials, finish and design. Elaborate handwork, ultra-modern technology, the best raw materials, functional precision and aesthetic form put Rubis in a class of its own. More than sixty years ago, the first precision tweezers were developed to place ruby stones into watch movements. Since then the brand Rubis has continued to represent precision tools made to authentic Swiss quality standards. The quality of Rubis product is the result of applying a combination of the latest technology with speed and superior traditional workmanship. Each tweezers is finished by hand under a loupe, to guarantee perfect tips alignment and Swiss top quality. Ideal span, high stability, an ergonomically correct form and resilience of material - best surgical stainless steel, antacid and non-magnetic - accounts for effectiveness and precision. State-of-the-art technologies and novel materials have been studied for the development of new, extraordinary and innovative products. 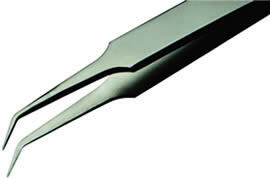 Tweezers are a simple tool - yet demanding in their specifications. They require continuous engineering and development to keep pace with their applications for the newest and ever changing technologies. With more than fifty years of experience, RUBIS tweezers represents authentic Swiss quality. The material used in these tweezers is SA steel, which is acid-proof, stainless steel, 100% antimagnetic and it is resistant to HF and nitric acid. Thick and flat, medium sharp and strong tips for heavy duty work. Serrated handle. 110mm (4½") long. Same as No. 00B with serrated tips and handle. 120mm (4¾") long. Very sharp, well-groomed points with fine finish. Comes with a unique finger actuated locking device. Length 110mm (4½"). Super-fine points. Length 110mm (4½"). Same as No 5, but with finger actiuated locking device. Length 110mm (4½"). Same as No. 5, but with 35° curved tips. Length 110mm (4½"). Same as No. 5, but with round curved tips. 110mm (4⅜")long. Short and wide with fine tips. Length 90mm (3½"). Flat fine points. Length 90mm (3½"). Pointed, thin and fine mini-tweezers. Length 70mm (2¾"). Material: PBTP (Polybutylenterephthalate) with 20% fiber-glass. Good resistance to chemicals and acids. Flat tips. Length: 120mm (4¾"). Fine, strong hook tips. Length: 120mm (4¾"). Pointed, flat-contact-tips. Length: 120mm (4¾"). Flat, strong tips. Length: 120mm (4¾"). Flat points, flat-contact-tips. Length: 120mm (4¾").